We were in the Miami International Airport joined in a shuffling line of other travelers at ‘La Carreta’ … the famously successful Miami restaurant chain that also boasts ‘Versailles’ and ‘Casa Juancho’ in its culinary stable. It is one of our common stops in that airport despite the lines. They also own a number of the outlets for food there but it is the original that gets our attention. Primarily that has to do with my wife Janet and her allegiance to their egg sandwiches. 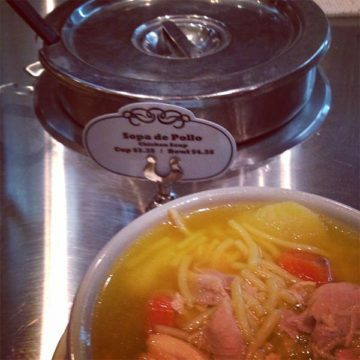 But … it was the aroma of Sopa de Pollo that was seducing my nose on our most recent visit. The gentleman in front of me in the queue was juggling a myriad of traveler’s trappings … that included sliding the plastic, red cafeteria tray while also manning his ringing cell phone in one hand and what might have either been a stargazer’s telescope or fishing poles in a long cardboard cylinder in the other. He looked worried about having to set his packages down while jockeying the piping hot bowl of his ‘sopa’ to a table in the bustling dining room. I volunteered to watch his stuff while I waited for our egg sandwich. I ordered it with my lousy kitchen Spanish that my son would cringe at… but I still usually get smiled at for ‘effort’. My fellow airport denizen dropped off his tray laden with the aromatic broth based soup and came back to pay and get the remainder of his things. By then I had added a Sopa de Pollo to our order. I knew we wouldn’t be able to eat it all … but when you are about board a plane you often look with a bit more … ‘carpe diem’ spirit! In a continuation of said spirit … I ordered two beers as well. Little did I know that when I was grown I would be comparing my mother’s chicken soup to Sopa de Pollo. Had I grown up in places like Japan or modern day New York City I might be cherishing a bowl of ramen and thinking that it is much like my mother’s chicken noodle or this Spanish named version of ‘edible equanimity’. Though my mother would not have been as nearly concerned with the noodles nor the stock as the modern day ramen zealots are. Ramen is rightfully as revered as it is in the zeitgeist of today’s America… and I’m glad. The reason is that it requires making a beautiful stock. If there is one thing that I think people should not be without … it is homemade stock. And the ‘go to’ stock of all time is chicken stock. When I arrived at the table Janet was saving for us she looked at the soup and cocked an eyebrow my way. ‘This is not the tradition we follow’ … it seemed to say. But she knows that when it comes to my curiosities in terms of food she too is ultimately … along for the ride. The vegetables were softer than what a classic French Chef might expect. The noodles would not make a ramen disciple bow. But it was damn good and the cold beer helped me balance the temperatures in my spoon’s trips to my gratified mouth. If you are set on having “Pollo” vs. Pavo just switch the meats used. But this is also very delicious! Nearly half of the meat in this “Soup of Turkey” is obtained from the neck of the turkey. Its economy is a wonder given the deep flavor we find there! Season the turkey pieces with salt and pepper. Heat a large soup pot or Dutch oven over medium- high heat. Add the olive oil and sear the turkey pieces on all sides. (This should take about 10 minutes) As they are seared remove them to a platter. Quickly add the butter, garlic, onion, celery, carrot and fennel. Stir to coat. Caramelize about 10-15 minutes, being careful not to burn the bottom. Remove the vegetables to a bowl and set aside. Add the wine to the pot and scrape the bottom with a wooden spoon. Return the turkey and add the stock. Bring to a simmer, lower the heat to continue simmering and skim any impurities that may come to the top. Add the thyme sprigs and bay leaves and cover. Simmer for 1 ½-2 hours, or until the turkey is tender. Remove the turkey to a platter (The necks may take longer, so take the legs and thighs out to cool and leave the necks in for another 20-30 minutes). Strain the broth through a fine mesh strainer into a clean pot. Over medium low heat add the chopped thyme and stir. When the turkey is cool enough to handle take it off the bones and pull apart with your fingers and cut into bite-sized pieces. Add the pieces back to the broth along with all the vegetables. Bring back to a simmer and cover. Serve. Serving suggestion: I sometimes garnish this with “Basic White Rice” or “Arepas”.